An extra post for you today because I just had a brilliant idea… mostly because I just saw this little fun thing and thought it was awesome and decided to make it part of the Fantasy Month celebration! Isn’t that super cool? 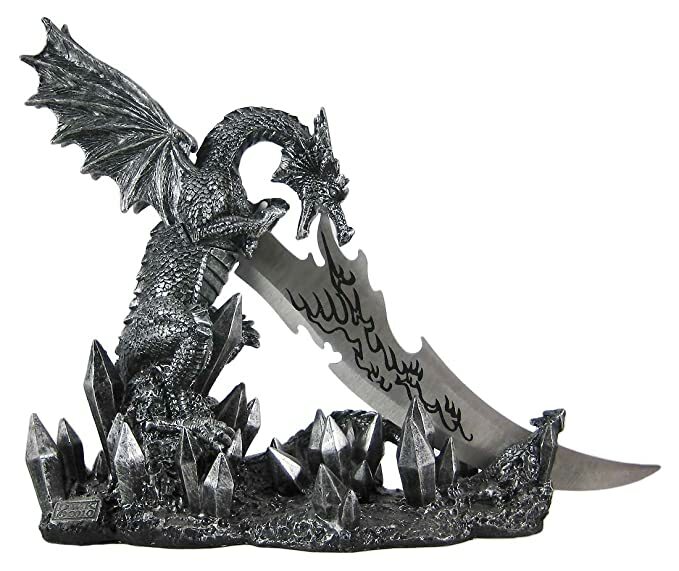 It’s a letter-opener… and it’s a dragon! So here’s the deal. I’m making this into a February is Fantasy Month Giveaway! Whoever leaves the MOST COMMENTS on the tour blog posts over the course of the month will win this little guy! Any blog post on the tour is fair game, and I’ll give you until March 3 to get your comments in! In the case of a tie… I’ll pull names from a hat! Ooooh. I love this and I want it. How long’s the blade? It looks like it might be short enough that I could get way with having it at college . . .
Ahhhhh. That’s probably all right, then. Some letter openers are sharp, though, so I thought I’d ask. Yeah, the reviews say this one isn’t very sharp and can’t really be sharpened, though it’s kinda wicked looking. Got it. So it’ll look cool on my desk and maybe make a decent addition to a fantasy costume for my dorm’s Halloween event, but it won’t get me in trouble with my RA. Fabulous. That thing is sooo cool. I thought it was pretty fabulous!